I’ve eaten more falafel in the past year than in the rest of my years combined. I thought I’d mastered it, but after having several variations in Berlin and around Denmark, I decided to revisit it. This recipe isn’t very different from my earlier one, but to my taste, it’s an improvement. It omits the oregano and parsley, lightens up on the cumin and coriander and adds turmeric and lemon juice. 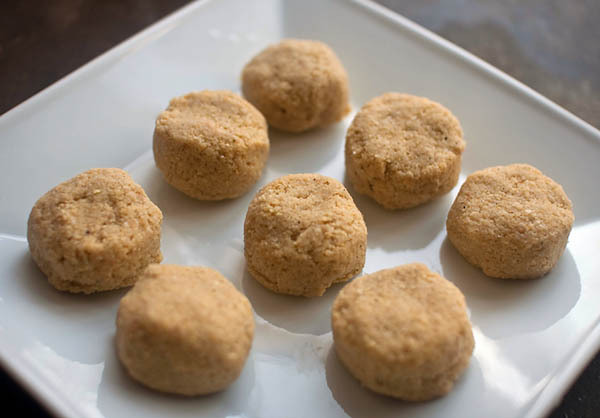 I’ve since improved this recipe again by replacing the breadcrumbs with bulgur, you can find my falafel recipe with bulgur here. I keep it in the fridge and cook it as needed, which is much smarter than my old way of cooking it all at once, then reheating it. I use my cookie scoop to keep the patties uniform, it’s the perfect size! AYou can choose to freeze all or part of the batch by following these instructions. Soak the chickpeas overnight. 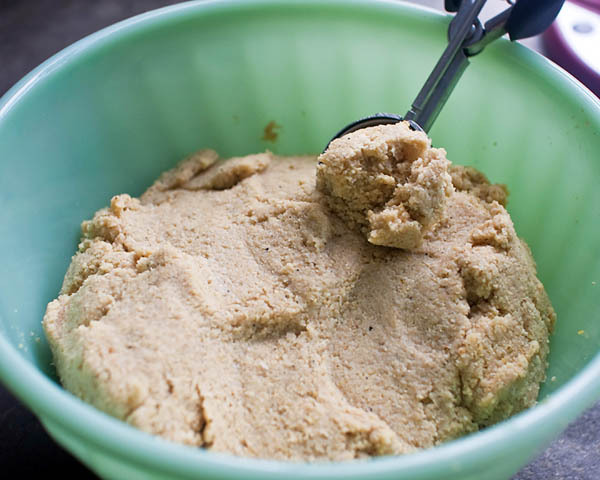 Drain, rinse, and run them through a food processor outfitted with a blade. Add the rest of the ingredients and process just until smooth and well blended. If the mixture seems too dry, add some additional lemon juice; the breadcrumbs are a variable here, so it might be too wet, in which case you’ll need to add more breadcrumbs. Form the mixture into small patties, and flatten them slightly. I’ve found that poking a hole in the center of the patties helps them to cook through, I use a wooden kebab skewer, but a toothpick would work. Deep fry them at 375 degrees for about 5 minutes. I serve them in warmed durum bread, which is readily available and cheap at the Middle Eastern grocery store here. I dress them with lettuce, tomato, garlic-yogurt sauce, and this spicy sweet red sauce. I’ll also tell you how to make baked falafel that’s every bit as delicious as fried falafel, but much lower in fat, and much less of a mess. Many of the pizza places here also sell kebab and falafel. 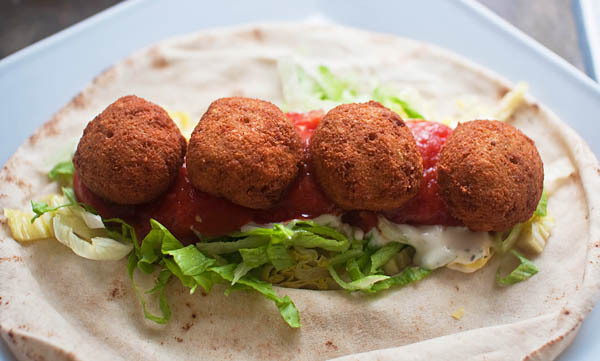 The falafel is served in pita bread or durum rolls. I always go for the durum roll because it’s bigger, of course! In Berlin, the falafel is served with a variety of sauces, which is what inspired me to look beyond tzatziki when dressing my falafel. One place even served it with feta, which sounded weird at first, but turned out to be delicious! Yay, falafel! So many helpful tips, too! Looks yummy, and you make it sound so easy, too!